Top-seeded Stanislas Wawrinka saw a resurgent Vasek Pospisil of Canada concede their semifinal at 6-4, 5-5 Saturday at the Chennai Open due to a back strain. Stanislas Wawrinka and Edouard Roger-Vasselin registered hard-fought wins to set up the final of the Chennai Open on Saturday. Top-seeded Wawrinka saw a resurgent Vasek Pospisil of Canada concede their semifinal at 6-4, 5-5 due to a back strain while Frenchman Roger-Vasselin sweated it out against Spanish player Marcel Granollers for a 6-2, 4-6, 6-3 victory. The eighth-ranked Wawrinka was surprised when Pospisil, the fifth seed from Vancouver, withdrew just after he had struck rhythm following some unforced errors at crucial junctures. Wawrinka, the only top-10 player in the fray, won the first set as he went a break up in the fifth game when Pospisil made two errors and double-faulted two times. The script seemed to be following similar lines in the second set as the Swiss managed a break in the seventh game with Pospisil double-faulting twice. 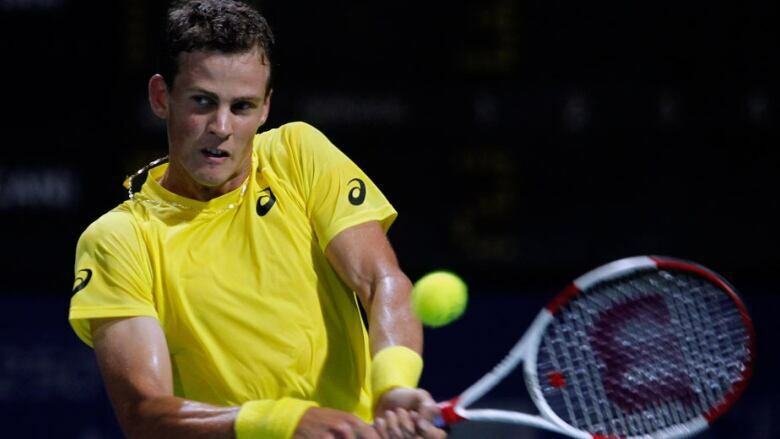 But Pospisil broke back for 4-4 but lasted only a few more points. "It was a really tough match and I felt sorry for him because he was playing very well," Wawrinka said. "My focus is to be aggressive. I'm playing my best tennis since last year and I think it'll be a good final against Edouard, who is a good friend." Wawrinka and Roger-Vasselin are 1-1 from previous matchups. Wawrinka will be playing for his fifth ATP title, and second in Chennai after victory in 2012. Seventh-seeded Roger-Vasselin seeks his maiden ATP title. In his semi, Roger-Vasselin made the only break of the first set in the sixth game and faced stiff resistance thereafter. Granollers went a break up in the third game of the second set and held on, and the decider was also tight. Granollers broke in the first game but failed to hold his serve in the fourth after warding off four break points. Roger-Vasselin seized the initiative with some surprise forays to the net, breaking serve in the sixth game to go 4-2 up in what was to be a decisive lead. Roger-Vasselin expressed relief after the two-hour encounter against his sixth-seeded opponent. "It's great to make the final," he said. "It was a long, tough match both mentally and physically. I'm relieved to have won. It's been a great start to 2014."